Redstone is popular for corporate outings, charity tournaments, and groups. We work extremely hard to make sure that everyone who visits Redstone with an outing or group has a wonderful day, offering on-site accommodations and a historic log clubhouse that can hold up to 125. With superb mountain golf plus all that the West Kootenay has to offer, it’s no surprise that Phase I of the development sold out quickly. Home sites, duplexes, and fourplexes are currently available. Living at Redstone, enjoy a “backyard” with some of the best golf, nature, and activities in the country. Is Redstone the Most Beautiful Golf Course in Canada? Recently, we had a visitor from Maui play golf at Redstone Resort. Maui is home to some of the most beautiful and scenic golf courses in the world. Here’s what he said about Redstone. Redstone is better and prettier than anything I’ve seen on Maui. 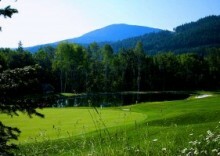 Located in Rossland, British Columbia, within easy driving distance of the Seattle and Vancouver areas, Redstone Resort features the only Les Furber “Signature” course in Canada. In addition to golfers, Redstone has attracted home owners who have chosen Redstone for their primary or vacation home. The historic clubhouse offers classic pub fare from a Red Seal chef and the resort can host weddings and banquets. The course is semi-private, offering membership opportunities and public play. Perhaps you’ve visited some of the many beautiful alpine golf courses in Canada: Banff…Kananaskis…Whistler. Redstone is easily on a par with those courses when it comes to scenery and the quality of the golf.